With the signature line “There can be only one,” the foreshadowing for what would become the second installment in the Highlander series could not have been more eloquent. Highlander 2: The Quickening is known as being so bad that the storyline of Highlander 3 ignores it entirely. “Pretend it never happened,” the producers seemed to say. Oh, but it did happen and it is a complete disaster. Since this is our first bad movie we’ve attempted to write a comic commentary for, we were determined to find one that did most of the work for us. Please note: This commentary is for Highlander 2: The Quickening. It will not sync with the later releases Renegade Version or the Special Edition. 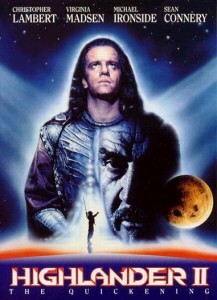 Highlander 2: The Quickening, which is the theatrical version was only released on VHS and, at the time of this posting, could be found on Amazon.com for $3 including shipping!